Tadg Riordan Motors were looking to promote their Toyota test drive weekend and their unique dealer offerings in a high quality package but at an economical price thus improving the return on their advertising spend. Webprint were able to provide a complete design, print and distribution package for Tadg Riordan Motors. A commercial quality 8 page magazine on high grade premium paper complimented Tadg Riordan Motors Toyota range. 70gsm woodfree uncoated (103 brightness) fine-paper was selected on which to print the brochure as its bright, tactile quality was perfect for showcasing the Toyota car range. Standard magazine (269mm x 340mm) was chosen as the product size to set it apart from other untrimmed or folded products on the market and to stand out from the carrying newspaper. It also makes it suitable for use as point of sale material in the dealership. This product size gives a 46% increase in print area versus A4 brochures. This allowed Tadg Riordan Motors to get many more messages into the 8 page brochure. As well as the main message regarding the Toyota test drive weekend Tadg Riordan Motors were able to advertise their own unique offerings: winter servicing, accident repair centre, used car sales, unique serving offerings and special anniversary offers. The increased size and pagination of the brochure meant that Toyota Ireland would give Tadg Riordan Motors a substantial advertising subsidy. Distribution was through a number of free-sheet newspapers and via door to door distribution in the catchment areas of both of his dealerships. The colour schemes chosen, the bright, white, matt paper and the crisp, clean, glare-free reproduction set this catalogue apart. The combination of the high grade paper and finished size created a premium brochure to display the Toyota range and offerings unique to Tadg Riordan Motors. 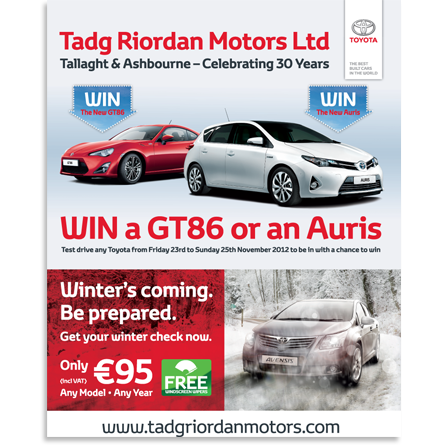 Tadg Riordan Motors were able to get an innovative larger brochure for the same price as they usually paid for a smaller brochure due to the advertising subsidy from Toyota Ireland. This format is proving very popular with other motor dealers.